Pierre-Auguste Renoir frequently used mistresses, including Suzanne Valandon, as models. The most famous is Aline Charigot, a provincial girl whom he met in 1880 when she came to Paris to learn dressmaking. She more or less immediately became his mistress, and after a decade together, and the birth of their first child, they married. This portrait of Aline Charigot was painted around 1885. Although he painted women in a beautiful and sensual way, Renoir was by all accounts something of a misogynist; "I like women best when they don't know how to read, and when they wipe their babies' bottoms themselves," he once remarked. 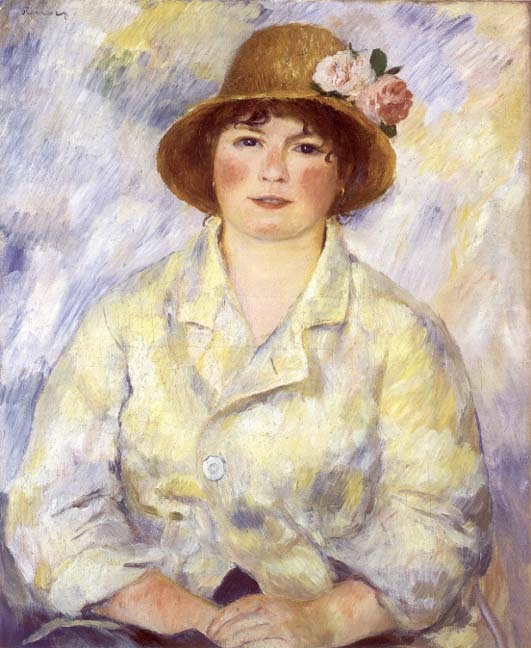 Renoir did not do many portraits of Aline, but she does appear in many of the group scenes he painted including the very famous Luncheon of the Boating Party which was painted the year they met. "We think of him, primarily, as a great topographer of the human face, his own and others', Jewish and gentile, male and female, young and (especially) old. And so he was. Nowhere else in 17th-century art is there a more beautiful and respectful portrait of a woman in old age than Rembrandt's Margarethe, with that starched white ruff like an immaculate millstone about her neck..."
Easy Street (1917) is one of a dozen short films Charlie Chaplin made under contract to Mutual Films. When the tramp (Chaplin) strays into a mission he immediately becomes infatuated with a mission worker (Edna Purviance) and returns a collection box which he has taken. Now reformed by his growing fondness for the mission worker, he joins the police and is assigned to the rough neighbourhood of Easy Street. Unable to trick or beat the local bully (Eric Campbell), he puts the bully’s head in a gas lamp and anaesthetizes him into submission. Now a hero, he gives help to many poor people living on Easy Street. When the bully escapes jail and kidnaps Edna it is Charlie, aided to no small extent by his having accidentally injected himself with narcotic, who rescues the mission worker and cleans up Easy Street. The strengths and weakness of this film were well summed up by Philip French in his Observer review when it and others of Chaplin’s Mutual films were issued as a DVD boxed set. One of the best of the many Charlie Parker recordings of this 1934 Johnston/Coslow number (which was introduced by Ivy Anderson and Duke Ellington in the 1934 Mae West film Belle Of The Nineties) was recorded in New York November 1947 with Parker on alto sax, Miles Davis on trumpet, Duke Jordan on piano, Tommy Potter on bass and Max Roach on drums. Parker’s playing on this recording is full of melodic invention, while Davis’s solo, an understated half chorus that comes at the end of the recording, has been described in some quarters as an ideal ‘emotional counterweight’ to Parker.